If you have tried virtually every product or cure for bad breath with little or no success and are struggling with feelings of anxiety, embarrassment, and lack of confidence because of it, you should know there is help! The key to eliminate chronic bad breath comes with understanding the relationship between the bad breath triple threat: bacteria, biofilm and the tongue. Once you see the connection, you’ll understand why everything you’ve tried in the past hasn’t worked and understand the only solution that will. The problem with home remedies, doctor-prescribed antibiotics and over-the-counter products that promise to get rid of bad breath is their limited effectiveness. Once the remedy has worn off, the bad breath odor is still there! The reason lies in the connection between the factors that are causing the problem — bacteria, biofilm and the tongue. While it would seem that good oral hygiene plus anti-bacterial mouthwashes and, in some cases, antibiotics should eliminate bad breath for good (and why many dentists even believe this is the case! ), the truth is: unless the root factors causing the bad breath are totally eliminated, bad breath will always come back. Once you recognize the connection between bacteria, biofilm and the tongue, then you can see why professional treatment by a doctor specializing in halitosis elimination at its source is the only way to be truly free from chronic bad breath. It is true that there are both good bacteria and bad bacteria in your mouth right now. In fact, an adult can have between 300-500 different types (species) of bacteria in their mouth at any given time. The mouth is a complex place and needs the right balance of bacteria to maintain a healthy, odor-free environment. Usually, good oral hygiene (regular brushing and flossing) along with healthy foods we eat (like fresh, crunchy vegetables) and our own natural saliva will be enough to wash away the day’s worth of bad breath-producing bacteria. But for some people, this is not the case; and, the bad, odor-producing bacteria start to grow at such a rapid rate that a bacterial imbalance occurs in the mouth. When this happens, the bacteria react to the imbalance by producing even more foul-smelling odors. Within the bacterial biofilm, the bacteria thrive and grow in numbers and strength. If left unchecked (and this can be in as little as 24 hours! ), the bacteria, food particles, proteins and more will turn into a sticky, gooey coating (or layer) called biofilm that acts as a protective armor (and a food source!) for the bacteria just below. Over time, the biofilm layer gets thicker and thicker which makes it near impossible to clean away the sulfur-smelling bacteria underneath it. 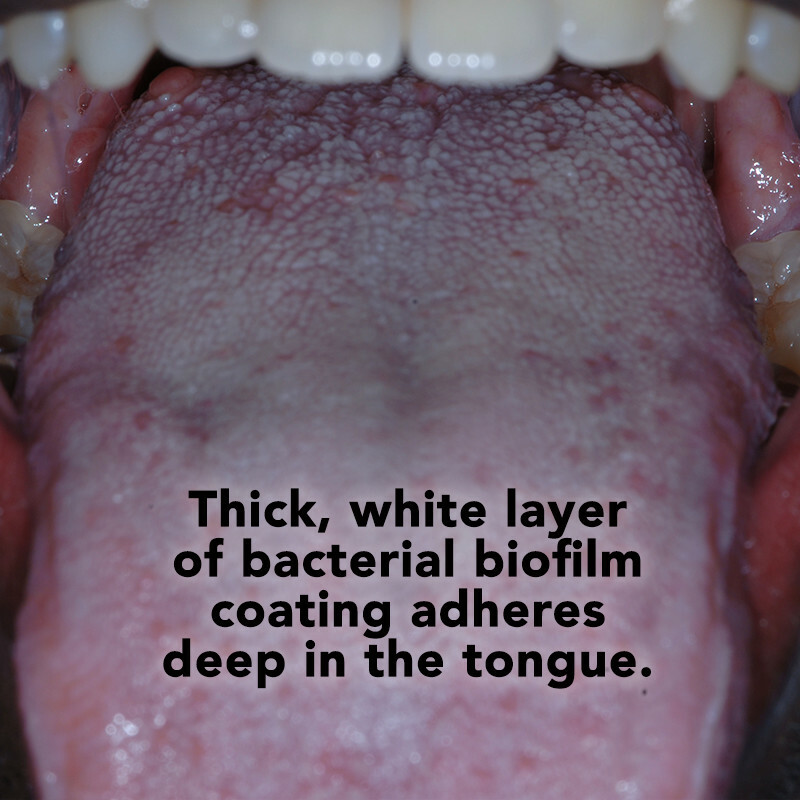 In many instances you will find this biofilm layer deeply embedded on the back of the tongue and even coating the tonsils. Lack of saliva or a dry mouth can disrupt the bacterial balance in the mouth and cause individuals who are following proper oral hygiene habits to suffer from halitosis. In these cases, individuals may need to examine their diet and limit the foods or beverages (like coffee) they are consuming which may contribute to a dry mouth. If you are an allergy sufferer, the post nasal drip in the back of the throat provides a source of protein for the bacteria to feed on and grow. It is also possible that if you are taking prescription medication, one of the side effects may be dry mouth. A dry mouth promotes the growth of these bacteria and thus their byproducts – offensive mouth odors. Biofilm is a thick, sticky, gooey coating that coats the teeth, tongue and gums. It is usually a white, yellow or tan-colored coating on the tongue. Biofilm is made up of bacteria, food debris, dead cells, and sugars, proteins, carbohydrates and other digestible bacterial matter. The biofilm acts like a protective fortress for the millions of bad breath bacteria on your tongue. The biofilm lacks oxygen which is perfect since bacteria don’t require oxygen to live. The biofilm contains everything the bacteria need to thrive and flourish. Think of the biofilm like a city where many types (species) of bacteria live together. They happily feed on the waste of another. When there is a disturbance in the balance or an overpopulation of one type of bacteria, they will release greater amounts of smelly odors. If biofilm is not totally removed, the coating becomes densely packed and cemented together in layers, making any form of home treatment for removing biofilm nearly impossible. Professional strength mouthwashes and even doctor-prescribed antibiotics will only penetrate the very top layers of the biofilm, leaving the under layers intact and ready to continue producing their odors. The tongue is the largest single structure for the accumulation of bacteria that cause mouth odor. The most important point to note about tongue anatomy is every tongue is different. Some have fissures or grooves; some have bare areas where there are no tastebuds; and all people have taste buds in differing sizes, shapes and depths. The tongue has an average of 10,000 individual taste buds, each having 150 cells. Each cell can have as many as 100 bacteria attached it to it. The math is staggering: 10,000 x 150×100 = Our tongues can harbor as many as 150 million bacteria! The taste buds on your tongue come in differing shapes, sizes and depths. The sizes and shapes are what allow the bacteria and odors to get down to the bottom of the tongue base, creating a biofilm. This is the primary reason why tools like tongue scrapers have limited effectiveness. Since the tongue’s surface is so varied, there is no way a tongue scraper can reach the bacteria trapped between the crevices of the tastebuds. When tonsils are present, in many people, they also attract bacteria, decaying food, debris, and all the same components of biofilm along with very smelly odors. The presence of tonsil stones makes this even more pronounced. If an individual has thick layers of tongue biofilm accumulation, no amount or combination of home remedies will successfully penetrate the entire biofilm layer. Only professional treatment will completely remove the entire biofilm layer. This technique is called Tongue Rejuvenation. Unlike anything done at other bad breath clinics whose “cure” is ultimately a product-based approach, Tongue Rejuvenation is a hands-on, meticulous (but painless) technique that removes the causes of bad breath and helps you keep it from coming back. 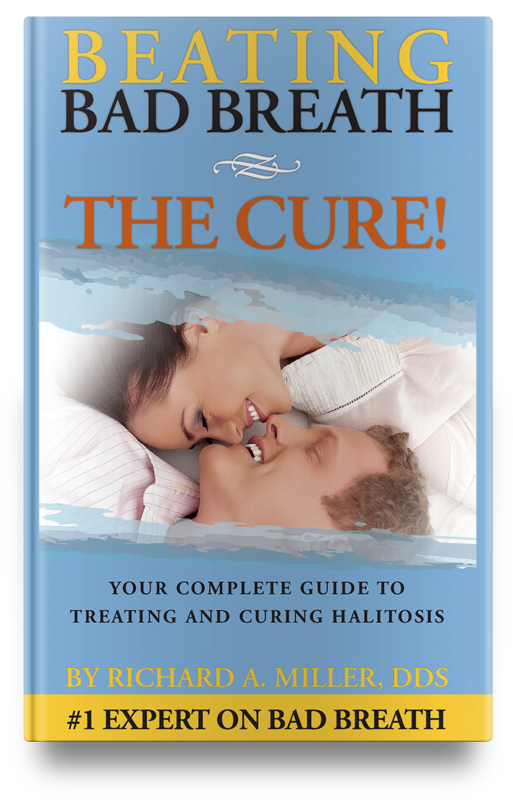 With a time commitment of five to ten sessions, 23-year halitosis expert, Dr. Richard Miller can remove the bad breath biofilm directly at its source and provide you an easy-to-follow maintenance program to keep it from ever returning. Since Tongue Rejuvenation is a hands-on treatment performed by Dr. Richard Miller, it does require a meaningful commitment in time and cost. It is not for everyone, but for those who are serious about regaining their confidence, joy and personal happiness in their personal/love life, professional and social life, this treatment has been life-changing to thousands of patients Dr. Miller has treated. Want to learn more about Tongue Rejuvenation? 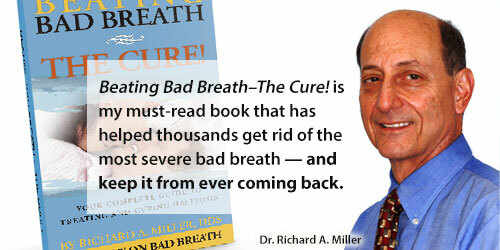 Download the Free Preview edition of Dr. Miller’s book, Beating Bad Breath – The Cure! ← Antibiotics for Bad Breath: Good or Bad?